It seems Femi Kuti, Yinka Davies and Jeffrey Daniel who were judges in the first season of the Nigerian Idol reality TV show won't be coming back for this year's show . As new judges were recently unveiled at the Rhapsody Lounge, Victoria Island, Lagos . 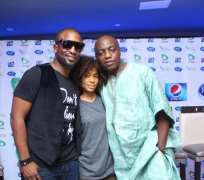 The new judges for this year's edition of Nigerian Idol includes RnB singer Darey Art-Alade, Dede Mabiaku, Nigerian-German singer Nneka , were unveiled as new judges for the TV show and the IllRymz will be returning as the host of the show.